...and not feel guilty about it. We have a saying in our house, "if you stand still long enough, she'll paint you". 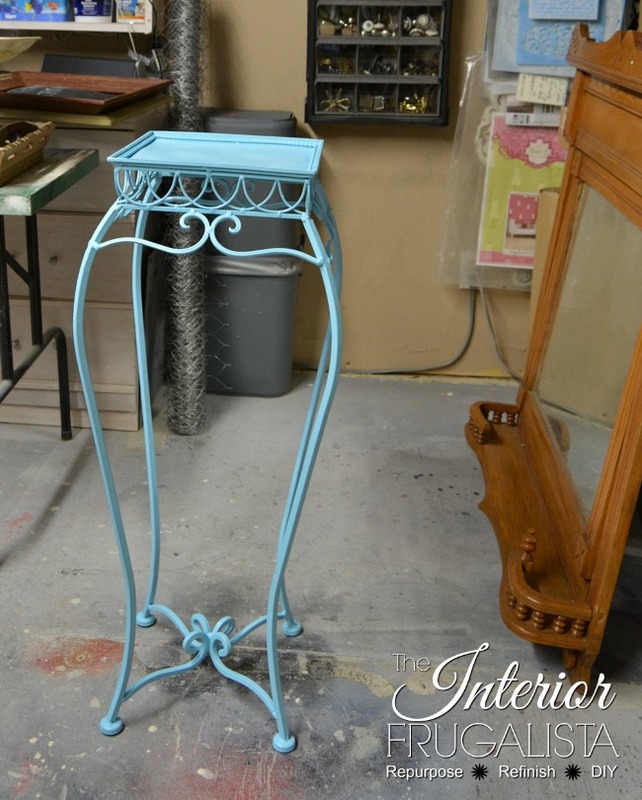 Such was the case with this perfectly good wrought iron plant stand. There was absolutely nothing wrong with it but you know what? Just because we acquire something, whether it be from a family member or friend, doesn't mean we have to keep it in its original condition if we don't like the finish. I loved the scroll detail and scalloped skirt around the top but I hated the dark antique bronze finish. In my mind, they were just begging for a pop of color. Besides, if I didn't give myself permission to make it my own, it would most likely end up in the corner of a room somewhere collecting dust. This is normally where I share a before picture. As I was about to press the button on the spray paint can I asked myself if I'd taken a before picture. 100% certain that I had too lazy to go back inside to check, I got busy. 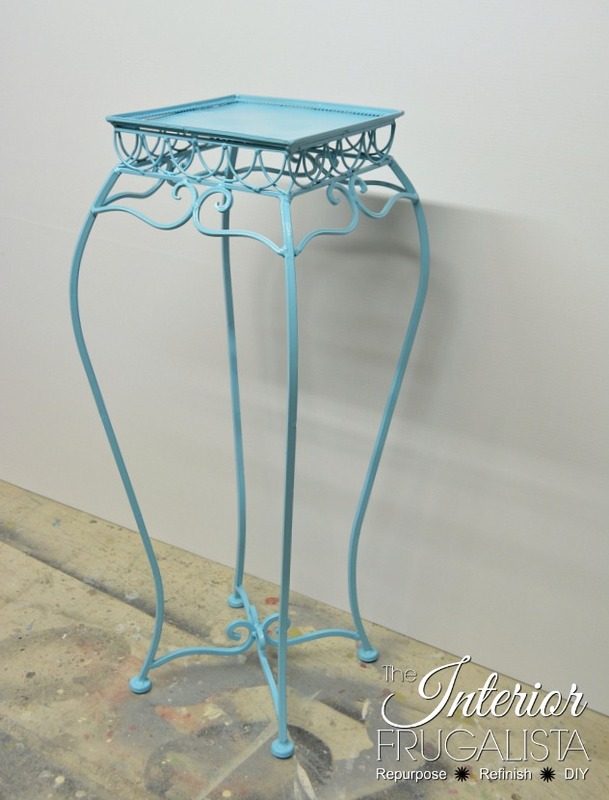 Ahem...imagine this plant stand in an antique bronze finish. I only needed these three supplies and an afternoon to get the job done. Disclosure: Below is the supplies I used to complete this project. 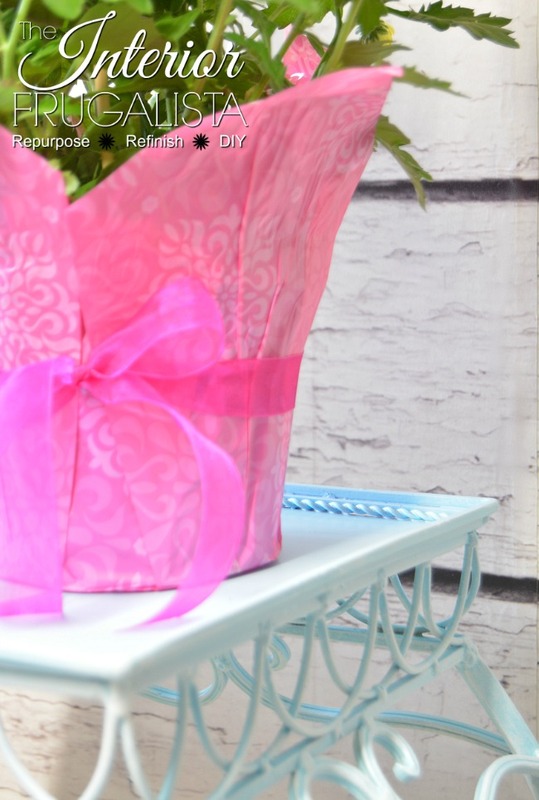 Affiliate links are included so you can see what products I used or recommend. If you make a purchase through the links, there is no extra charge to you and I will receive a small commission to support my blogging wardrobe with a fresh new set of pajamas (don't judge). See my full disclosure policy. Before painting the stand I gave it a good scrub, using a toothbrush to get into all the nooks and crannies. I made sure it was completely dry before applying the paint. I sprayed two light coats of Aqua, letting the paint dry an hour between coats. My preference is to flip the piece upside down and paint the underside first. 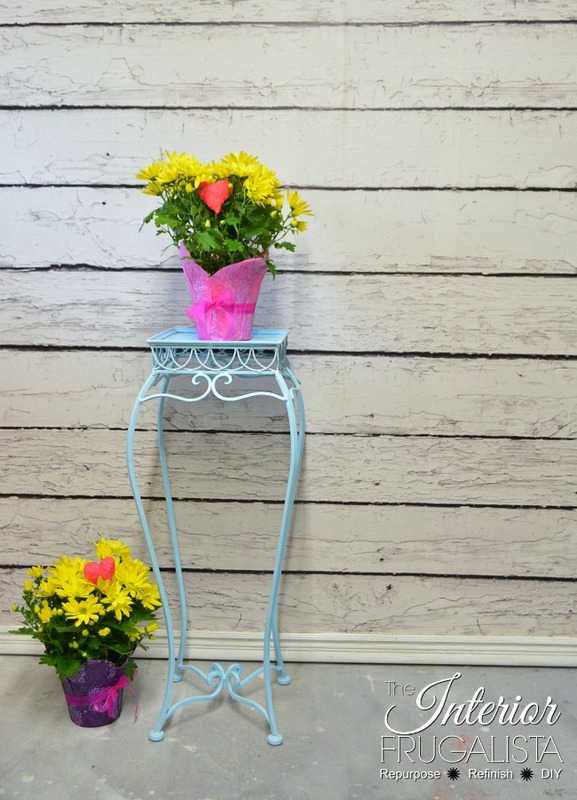 Remember to always use spray paint outdoors or in a well-ventilated area. Shake the can for around a minute before use and often during use. Hold the can around 10-12 inches from the surface. Spray lightly in a back and forth motion in long steady strokes. Wait an hour between coats. Paint will be completely dry after 24-hours. I wish I had the before picture to show you a comparison because this pretty Aqua made the plant stand come alive. Normally at this point, you would apply a clear coat protective finish but I had other plans. I wanted the beaded detail around the perimeter of the top and the scroll detail to be highlighted in white. 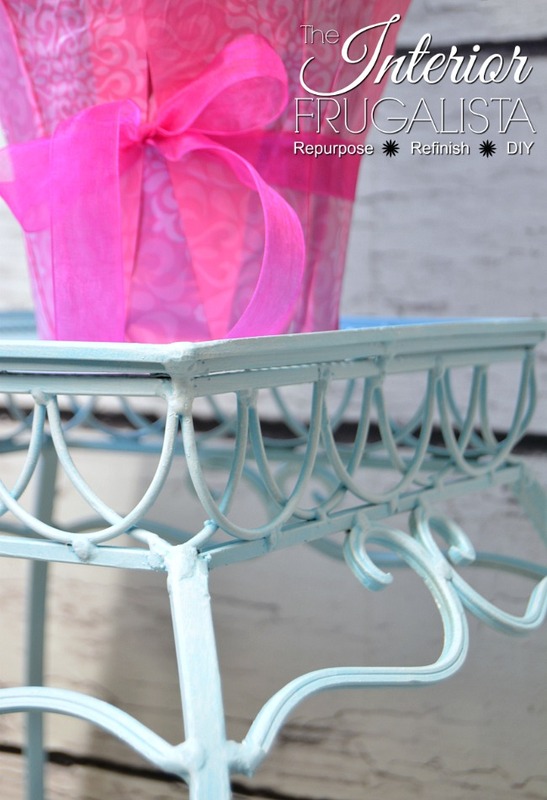 I imagined this plant stand being both indoors or outdoors and so using white wax was not an option. Instead, I applied white glaze and once fully cured (in about 3-weeks) it will provide a protective coat. Dip just the tips of an inexpensive chip brush in water to dampen (not saturate) the bristles. This helps the glaze move along the piece better. Next, dip just the tips into the white glaze and apply it over the paint in long brush strokes. Normally you brush on glaze and immediately wipe off the excess. Instead, working in sections, I thinned the glaze by moving it with my brush over as much of the surface as I could before having to reload. On the top, I applied the glaze much the same way in long even brush strokes. I left the glaze a little thicker in the nooks and crannies and divots in the metal, especially on the scrolls and beaded detail on the top. 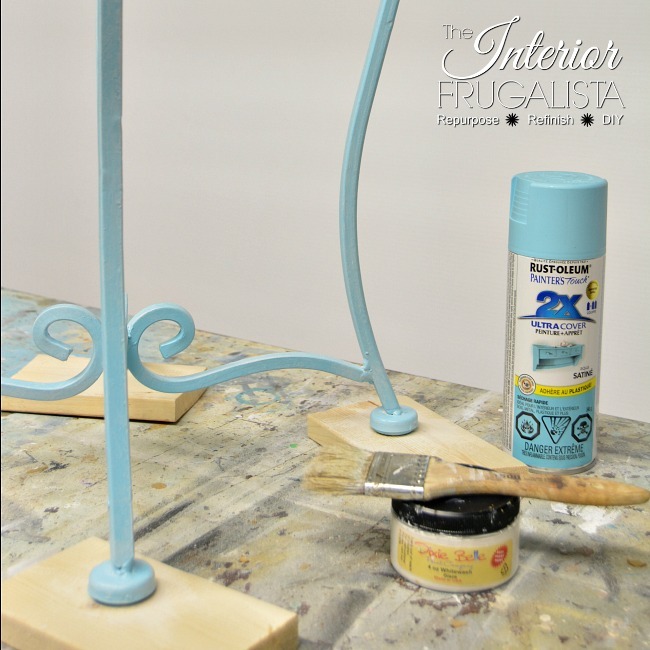 I love how the white glaze softened the Aqua paint color. 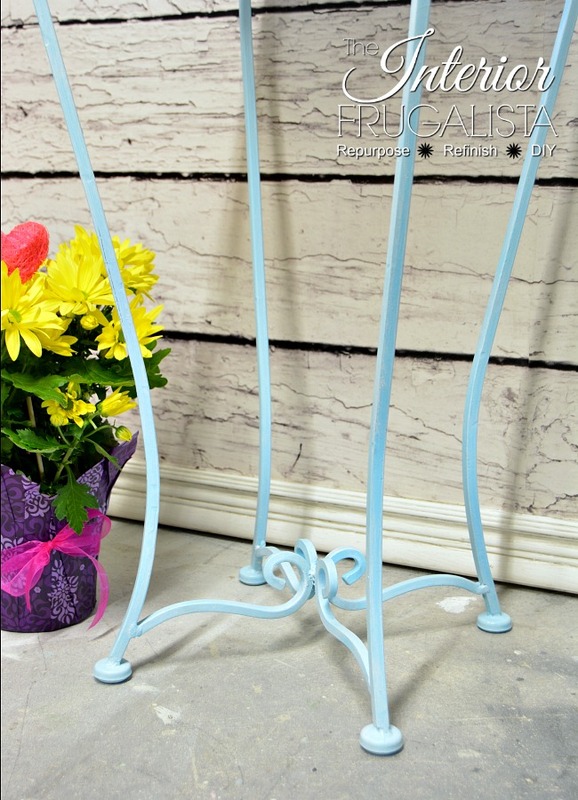 Now that the wrought iron plant stand went from dark and boring to bright and fresh, I could see it welcoming guests on a front porch or adding a pop of color on a backyard deck. 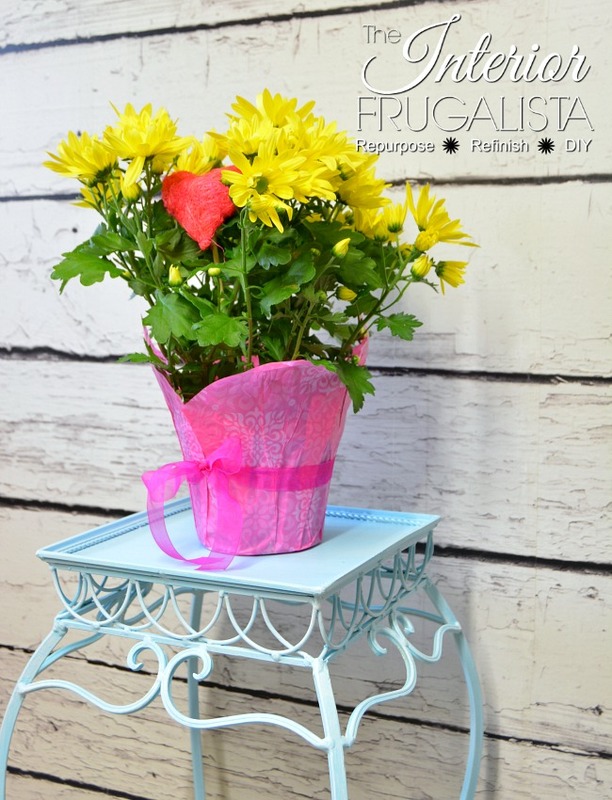 If taking a spray paint can to this wrought iron plant stand makes the difference between it being put to good use or hiding in the basement, then doesn't it make sense to paint it...guilt free? 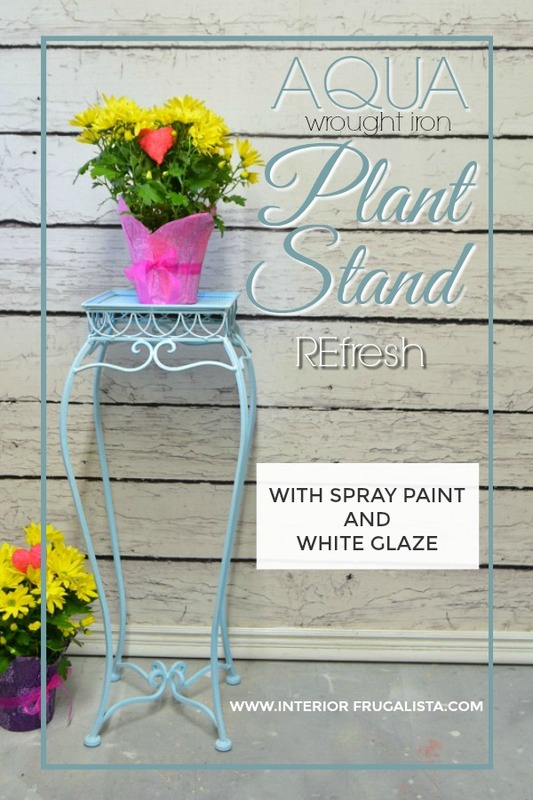 I hope I've inspired you to pick up a can of spray paint if it means putting that acquired plant stand or metal furniture to good use.